Photo - Karara Rural Fire Service on Facebook. 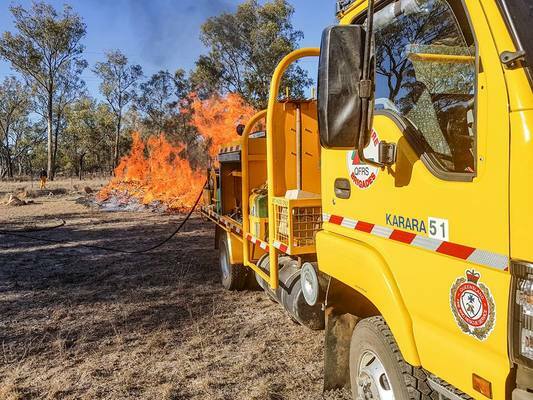 The bushfire at Karara west of Warwick has been downgraded to ‘advice’ level by Queensland Fire and Emergency Services (QGES) but residents are still urged to monitor the situation in case it changes. Yesterday, Sunday 2 December, QFES was warning locals to prepare to evacuate the village but a change in wind direction late in the afternoon reduced the threat from the fire. A 737 aircraft dumped 15,000 litres of water on the fire which also helped to slow its progress. As of midday today, Monday 3 December, the fire was still travelling from Strathyre Road towards the Toowoomba-Karara Road and Millmerran Road, with crews working to strengthen containment lines. A QFES statement said residents need to “keep up to date and decide what actions you will take if the situation changes”. “People in the area will be affected by smoke, which will reduce visibility and air quality,” the statement said.